Looking for commercial gameboy ROMs for visualboy? Go somewhere else, you dirty pirate. Proving that 32 KiB of sprite cel VRAM ought to be enough for anyone. All programs include full source code under a free software license unless otherwise specified. All programs have been tested on GBA hardware; those compatible with the VisualBoyAdvance emulator have been tested on it as well. To use GBA programs on hardware, you can use the Xboo cable or any of various GBA flash cards including the GBA Movie Player. (Look through various online retailers.) None of these programs contains any Nintendo copyrighted code except for logo code required to get the GBA to start and used fairly under the Sega v. Accolade precedent. To compile these programs, you may have to have both a native GCC and devkitARM installed, as these distributions include the source code for data conversion tools but may lack binaries. Some of the conversion tools may require the Allegro library, which is mirrored in the PC section. It's Lumines. It's Minesweeper. It's both. And you don't need a PSP. This program tests how fast data can be read from the CompactFlash or Secure Digital card inserted into a GBA or DS through an adapter. 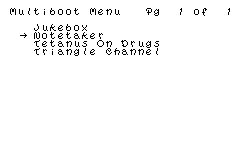 It works on any adapter supported by libfat, including those with GBA-compatible DLDI drivers. If your GBA's display has pixels that are stuck lit or stuck dark, this program may be able to coax them into working again. It also works on LCD TVs through a GameCube and Game Boy Player. Health Warning: This program works by rapidly cycling the color of the screen. It may trigger seizures in people sensitive to flashing lights. If you have a seizure disorder, make sure to turn over your GBA or close your GBA SP or Nintendo DS when prompted to do so. 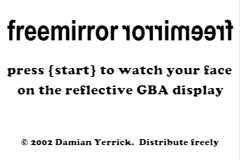 If you are using a Game Boy Player and you are photosensitive, have somebody else run the program for you. See your health care professional for more information on photosensitive epilepsy. This program, designed to be run in Game Boy Player, demonstrates reading a standard controller and a DK Bongos controller. (There is one drawback: the Game Boy Player's controller reading code has a pretty high threshold for what counts as a press of the R button, and clapping loud enough to trigger it may hurt your hands.) This package also includes a version of AGBTTY updated to work with devkitARM. If you're having problems compiling it, please read the instructions in readme.txt. The 8ad binary demo is no longer available as of February 14, 2005. AGBTTY fills in a gap in the available development tools by providing a reasonably familiar text output interface that can implement write() to stdout. It handles all control characters defined by the C language, and it has a scrollback buffer. This works fine in (outdated) DevKit Advance R5 beta 3 but has not yet been updated to work with devkitARM. You might want to follow these instructions to get it working, or try the newer version in the bongos test. Vitamins is a falling pills game. The object is to move and rotate falling pills in line with like-colored space invaders to eliminate them. 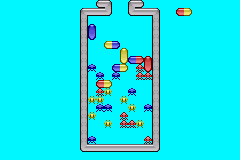 Though this is an early alpha release of Vitamins, with less than fully detailed graphics, no sound, and several options missing, let this go on record as the first native game with rules similar to Dr. Mario on the GBA platform and the smallest such game (an 18 KB binary) on any Nintendo platform. This program lets you put several GBA multiboot (.mb) programs into one ROM for use on a flash cartridge, etc. Because it uses the GBFS library to locate the programs, the programs can be any size, up to 256 KB (the maximum size of a .mb program). 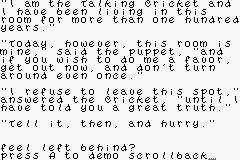 It includes an 8x8 pixel monospace bitmap font designed to look slightly "cutesy" like hand printing. It's based loosely on fonts such as Ziggy Zoe, Kristen, and the font used on the boxes of Precious Moments® merchandise. You may use this font freely in your own projects. GBFS is an alternative to the hassle of the various "incbin" hacks (such as bin2h, b2x, objcopyroda/interflip, etc.) 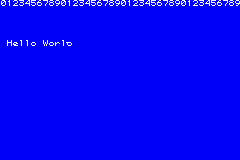 used to put binary data (such as graphics, text, maps, and sounds) into a Game Boy Advance or Nintendo DS program. It also has the advantage that artists and musicians will be able to see the effects of revisions to their work immediately on the emulator without having to recompile the program. It's analogous to the "appended datafile" method used in some PC games, especially those that use the Allegro library. Use the included tools to put all your media into a GBFS file (an archive similar to a zip file but not compressed) and simply concatenate the program binary to the GBFS file containing the data. Then use the library to find binary objects by name. TIP: If you have received a GBA or Nintendo DS program that contains the string "PinEightGBFS"), then it uses the GBFS library. 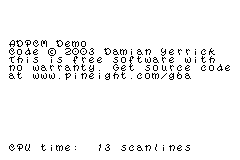 Make a copy of all data starting at the "PinEightGBFS", and use the ungbfs program included with the GBFS distribution. 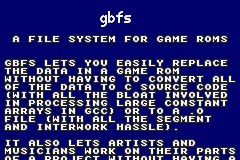 A demonstration program is included that rolls credits based on a font and text file both stored in a GBFS file. Feel free to borrow this code for your game's end credits. Release 20060815 updates the sample program's build script for devkitARM R19b, increases the number of files that can be put into a GBFS archive, and adds notes in the manual about issues related to the Nintendo DS. freemirror displays an image of up to 256 colors on a Game Boy Advance system. 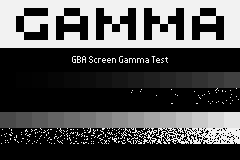 You can use this to test mock-ups of your screen layout to make sure that they work well with the size and gamma properties of the GBA display hardware. Then it turns the display black so that you can use its scratch shield as a makeshift mirror. Shows one way to use GBA's affine capability to draw 6-pixel wide tiles and create an effective tile size between 8 and 16 pixels wide, useful for puzzle games. Proves that the GBA display is interlaced the same way as the GBC display, with alternate lines being drawn darker and lighter in each frame. This fact could prove useful for advanced "cheating" techniques to improve fill rate for software rendering engines already running at 30fps, as seen in "fr018: aGb".